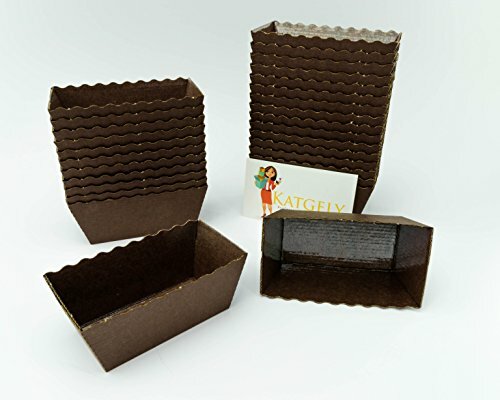 Katgely Dark Brown Mini Loaf Mold (Pack of 100). Sturdily designed to eliminate the need for metal baking pans and time-consuming clean up. For small treats and individual servings. Bottom Dimensions: 3 1/8" x 1 9/16". Top Dimensions:4" x 2". Height: 1 5/8". Sturdily designed to eliminate the need for metal baking pans and time-consuming clean up. For small treats and individual servings. Bottom Dimensions: 3 1/8" x 1 9/16". Top Dimensions:4" x 2"
If you have any questions about this product by katgely, contact us by completing and submitting the form below. If you are looking for a specif part number, please include it with your message.